Re-issue of the Licensed 1965 Phantom kit from Revell. The Phantom and Voodoo Witch Doctor 1:8 Scale Model Kit is an all plastic model kit made from the original Revell molds. This injected plastic kit comes molded in purple with detailed instructions and original vintage sell sheet. 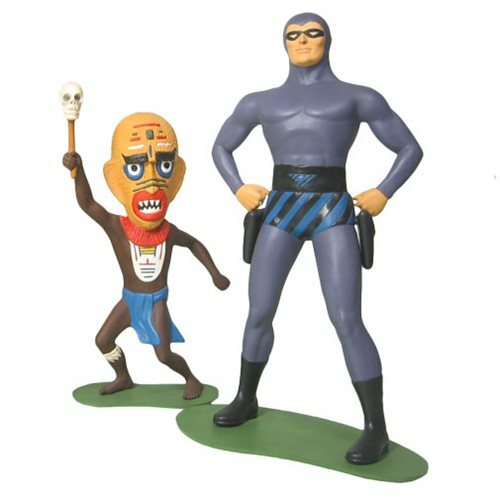 Includes The Phantom and the Voodoo Witch Doctor figures come with display bases and nameplates. Original box art with build ups done by Andy Yanchus. This model kit is a skill level 2 that requires glue and paint for assembly. For ages 12 and up.